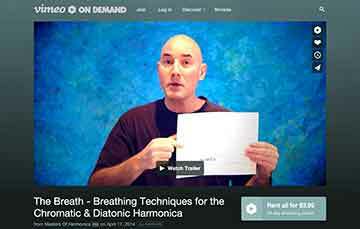 We just completed our 7 part video series on BREATH, and this material will support and augment that. Many players have yet to come to terms with the idea that the chromatic harmonica is a breath instrument. I’d count myself among them early on in my playing chromatic harmonica! The BREATH is invisible in more ways than one. Of course we don’t see the breath with our eyes, but more than that we tend to lack much awareness of breath…and this creates problems for musicians. We concentrate on playing a given note, at the right time in a piece, but when was the last time you actually put time into practicing breath? Most players will answer as you did…not much time is spent on that. What kind of practice makes sense on BLOWS and DRAWS? 1) The first skill is to be able to equalize the sound and tone of a BLOW and a DRAW. Practice playing both with the same volume and tone. It’s not so easy to do, because the muscles you use to control BLOWS, are a different set of muscles from what we use to drive DRAWS. For most players, the BLOW is under more control than DRAWS. By practicing DRAWS under control for one minute a day, you can make great progress. 2) Another key skill is to be able to play a note on BLOW or DRAW very softly, so softly the reed barely activates, and then increase to the mid volument, then loud. As you become aware of the DYNAMIC or volume range of the instrument, you’ll find you have more confidence in playing. 3) Two of the most commonly used techniques supported by BREATH are Bends and Vibrato. Actually they are related, as VIBRATO can be thought of as a successive series of BENDS. When you practice Vibrato…try to balance the tone, volume and amplitude (amount of flatting of the note) between BLOWS and DRAWS. When you can control the pulse of Vibrato, playing at various speeds of rise and fall, and play at various volumes, you are really getting Vibrato under control. Everything you do with harmonica is supported by the BREATH, so there is no such thing as too much control. The more you practice BREATH the more your skills becomes visible…to you and the audience.